Do you ever…you know…get deja vu…? Have you ever had one of those moments when everything around you is familiar? The sounds? The sights? The people? The smells…even though its a completely new to you experience? How does that happen? It seems like it happens to me several times a year. Earlier this summer I was at a basketball clinic attending a meeting between my games. I sat in the back of the room, probably twenty feet away from the speakers, with one of my officiating partners directly in front of me. An odd feeling came over me and I started looking around the room because I had a feeling that I’d been in that room before listening to the same things being said with the same people being present and so forth. I shrugged it off since I’ve attended several of these kinds of clinics before and its not like I knew what the speaker was going to say next so I sat there listening. The speaker was making a point about “even if you’re a really good official you can’t always get the best games….sometimes you’ll get Clarksville.” A ripple of laughter went through the room as that particular school had struggled in basketball recently. I leaned forward and tapped my friend in front of me and whispered “hey…don’t laugh. I HAD Clarksville at Mesquaki this past season.” The speaker followed up with this “…sometimes you get a Mesquaki Clarksville game.” Holy cow…that’s the game that I had back in January six months ago. Was this just coincidence? Was it fate? How does this kind of stuff happen? Iowa doesn’t lack for small schools that struggle in sports (or large schools for that matter) and for the speaker to have used those two schools in particular was really odd for me since they’re not even close to each other (75 miles separate them), they’re not rivals and with the aforementioned feeling of familiarity with the situation left me shaking my head and thinking of how in the past this has happened to me before in other situations. How does someone five and a half hours away from Estherville even arrive in Estherville when they live in Illinois? What were they doing in northwest Iowa…there’s no relatives up there? How does a small town like Estherville even have souvenirs back in the 1950-60’s? It’s not like it was a tourist destination. How does someone from Joy Illinois even think to buy a souvenir from Estherville? It’s not exactly the crown jewel of Iowa. How does a little porcelain ashtray survive all of the moves from Estherville to Joy Illinois to Aledo Illinois to Mason City Iowa, in the house of a smoker and doesn’t even have a chip or burn on it? It just seems like I was meant to have this gift, like it was purchased for me specifically even though I wasn’t even born yet and even when I did possess it that it’s message wasn’t meant to be understood until I was old enough to, kind of, understand it. Its randomness is too specific for me to ignore. I don’t get it. Whether you believe that God’s hand is guiding us along the way and that if we slow down enough, look and listen that we’ll see Him at work, or guardian angels or loved ones that have gone on ahead of us…or a combination of things way above our own human conscientious…what is it and what does it mean? I still have that ashtray. 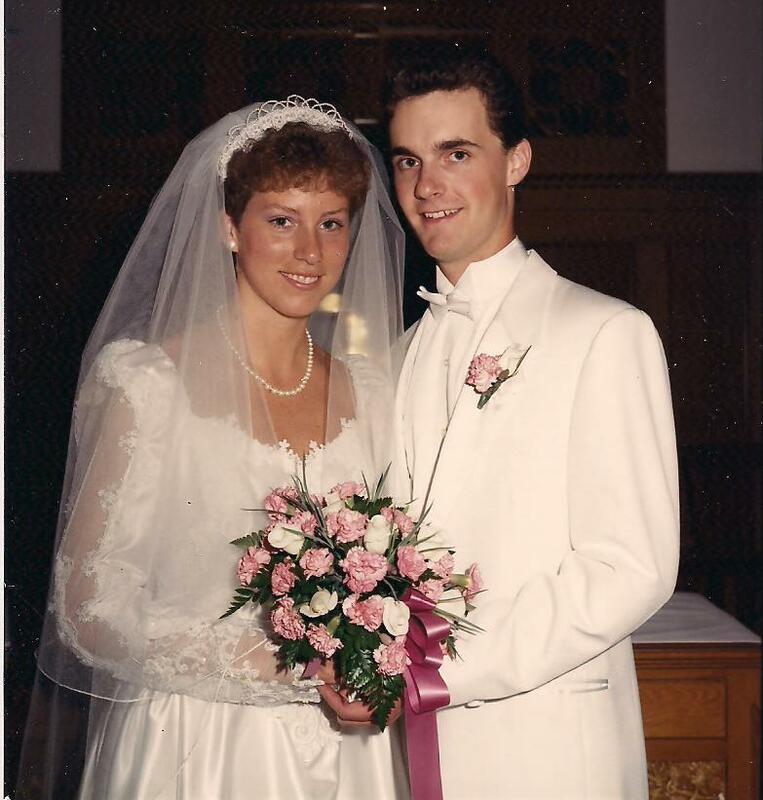 I married that bride 27 years ago on August 6th 1988 in Estherville Iowa. Two goofy kids on a hot, humid and utterly fantastic day. I still love that bride of mine. 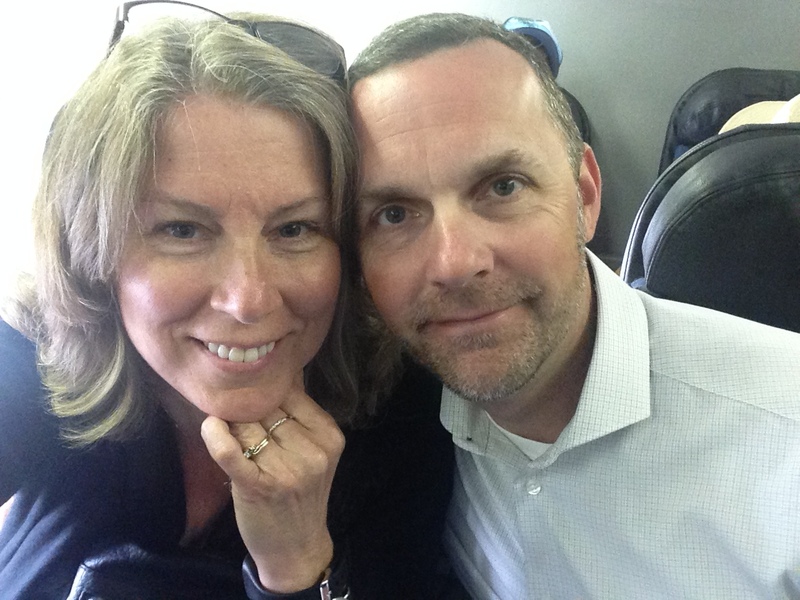 Still goofy after 27 years….and I wouldn’t want her any other way. Take care my friends. May God bless you and keep you in His way. After my Mom read this blog she corrected me. 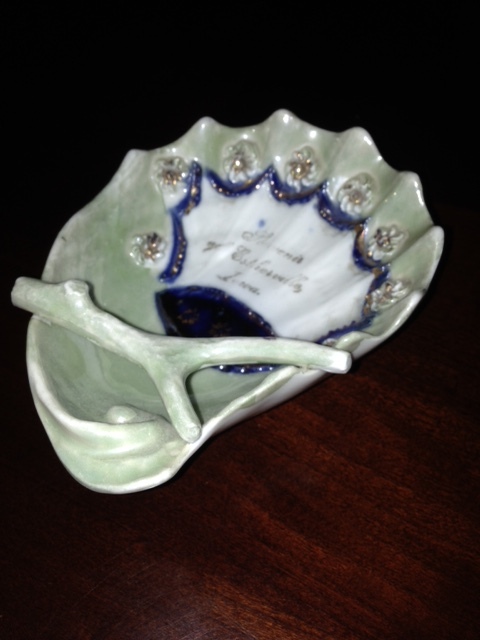 The ashtray was HER grandmothers (not mine…it would have been my great-grandmothers) which makes this even better!! Its around 75+ years old.